February 18 (Tuesday, 4 p.m. - For teens in grades 6-12) Black History Program at The Backspace. 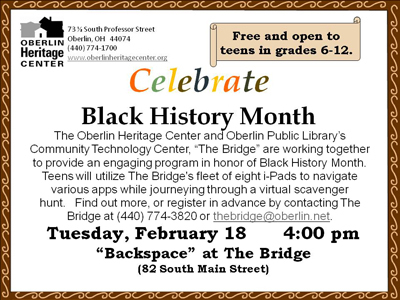 The Oberlin Heritage Center and Oberlin Public Library's Community Technology Center, "The Bridge" are working together to provide an engaging program in honor of Black History Month. Students will utilize The Bridge's fleet of eight i-Pads to navigate various apps while journeying through a virtual scavenger hunt. Location: The Backspace at The Bridge. For more information contact The Bridge at (440) 774-3820 or thebridge@oberlin.net.